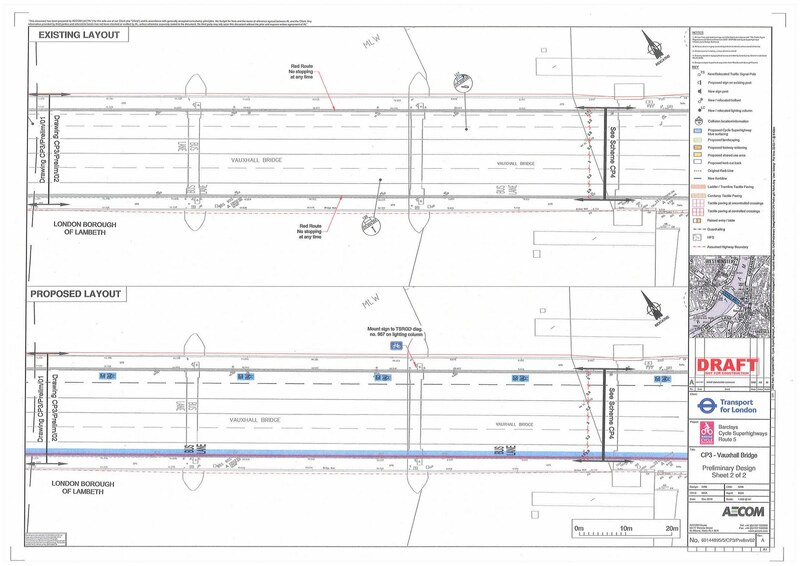 Cyclists in the City: Vauxhall Cycle Super Highway plans - more compromises on the gyratory. Some good, some bad. But it's all down to political will. Vauxhall Cycle Super Highway plans - more compromises on the gyratory. Some good, some bad. But it's all down to political will. Earlier this week I spent a happy evening walking up and down Vauxhall Bridge Road and around Vauxhall gyratory with none other than Transport for London. Happy days. 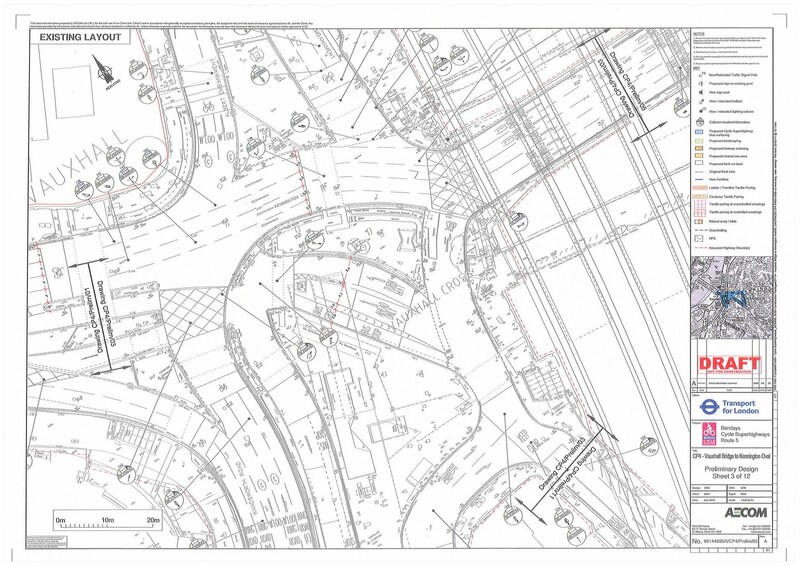 TfL contacted me after reading my comments on the SuperHighway scheme between Victoria and sunny Peckham, in particular relating to these comments here about Vauxhall Bridge Road and about the entry to Vauxhall gyratory here. And it was a very interesting evening. For lots of reasons. 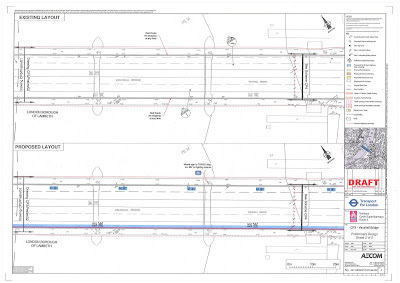 First and foremost, TfL has promised a written response to my comments about the scheme at Vauxhall Bridge. And I got a genuine sense from TfL that it wants to listen to cyclists and that it genuinely does want to make cycling 'work'. But I also got the impression, as I have on the couple of other times I've met people from TfL, that there's an internal turf war going on. And these are very much my words and thoughts, not those of anyone from TfL directly. That turf war seems to be between those who realise they need to take road space and allocate it to cycling to make it safer and more convenient to cycling. And those who just want to whack as many motor vehicles as possible through London's streets. And that's why we end up with this completely compromised mixed-bag of facitilies for cycling. Vauxhall Bridge itself. An image showing current and planned traffic arrangement. If you look at the picture at the top, you can see the current arrangement. A narrow bus lane heading northbound. Head south, though, and you have a cycle lane that is "worse than useless". TfL's words not mine. I've mentioned the approach to Vauxhall Bridge and the nightmare cycle lane before but you can see it in all its glory here. Not to mention the fact that the exact opposite conditions are in place further up the street where the nearside lane is 3.9metres. So, at one point, the nearside lane is just wide enough for an HGV to get past you. But on the bridge, the exact opposite is the case. Just picture the scene: There you are on your rather slow and slightly wobbly cycle hire bike. You're going to have to cycle in the middle of the lane to encourage motor vehicles to overtake you in the second lane. Not fun at all. I've already profiled what happens when you come off the bridge on to the gyratory. It's a mean, narrow bike lane with four lanes of motor vehicles beside you. All of you forced into a racing track-style curve which almost always features motor vehicles cutting in to your extremely narrow advisory bike lane. But back to my point about the turf war between the people who seem to realise you need to create proper bike infrastructure and the people who just want to ram as many motor vehicles through the roads as quickly as possible. Vauxhall gyratory heading from Vauxhall Bridge towards Oval. Because just when you despair about the design of this Cycle Super Highway, along comes something that's actually not truly bad. 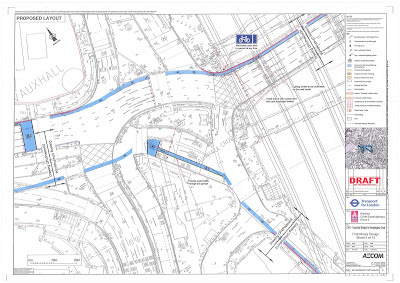 Here's the section of Vauxhall gyratory as you head off the bridge in the direction of Oval. At the moment it consists of five lanes heading under the railway bridge. It's pretty grim for cycling. I've been run into at least once here this year and near-missed pretty much once a week as I cycle through here. And here's the plan. From five lanes to four. Plus a new bicycle lane. Look in detail at what's going on and the motor vehicle lanes are all slightly wider than they are at the moment. There's a slight refuge area just before the bridge to keep motor vehicles away from cycles as they come round the race-track curve under the bridge. And then there's a mandatory cycle lane. The fact that the mandatory lane is only 1.5metres is disappointing. But the fact is that this scheme feels like cat and mouse. To me it looks like Cycle Super Highways are about sneaking in bicycle infrastructure that won't upset the motor vehicle contingent. Where they can get away with it, TfL's road engineers are putting infrastructure in place that at least hints at what is really needed. But a hint is all we get. No two metre wide lanes here. No safety for cyclists when they're on the bridge itself. But suggestions of what a bicycle lane could look like when it works. My Transport for London host was charming, informative and a keen cyclist. But he admitted "you need cultural change before people are prepared to accept that cars might need to wait [for cyclists and pedestrians]." That's exactly what's going on here, I think. Our Mayor wants to encourage cycling. But it seems that he doesn't judge the political mood as supporting priority for people on foot or on bicycle. Or in wheelchairs or motor scooters for that matter. I get the feeling that he feels he has to pander to the 'motorist'. Most people I know are motorists. I am, for one. But an awful lot of us think motoring is not the way forward in central London. We're clearly going to have to make sure London's next mayor realises that a lot of us think that way. Otherwise we're just going to get more of the same. It would be great news if they reduce the southbound vehicle lanes to one, the current cycle lane is appalling (i see you've linked to my video which shows just how bad it can be), the LCC reported on this issue last year, along with how bad all the cycle lanes are around that area! What i would be interested in knowing is how the cycle lane will continue around the gyratory northbound. 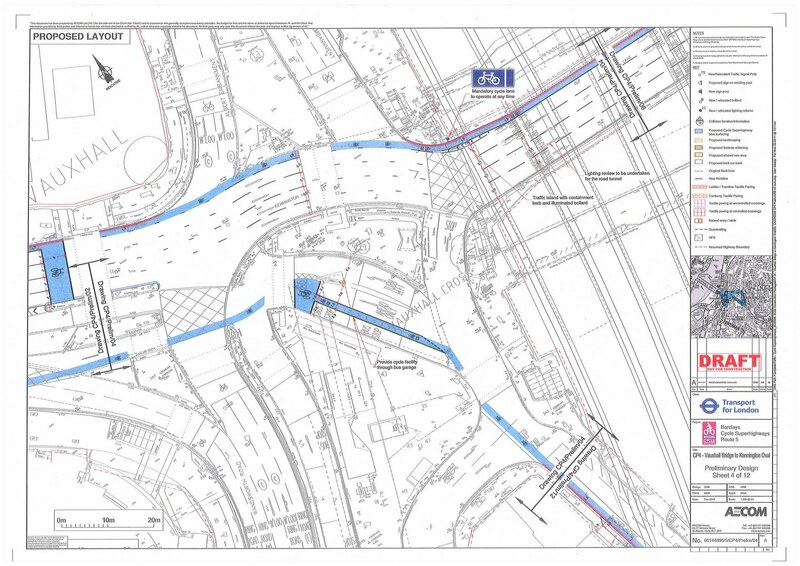 At some point cyclists are going to have to cross several (3 or more) lanes of traffic to get to the superhighway. Cyclists have been complaining about the lane switch on CS7 just after Oval when going northbound and that is only 1 lane! Hi Croydoncylist I've linked to your blog in my post and thought it was really good. I'm going to cover the northbound bit next week. It's insane. You'll have to do exactly what you've just flagged, cross three lanes. Twice in fact. Over to the right as you come from Oval, basically. Stared at the first before + after, of the bridge, for a few seconds, worked out what I was looking at, and laughed out loud. The bridge diagram should be published in every street design textbook as an example of a highway engineering joke. Perhaps, if we could get across the notion that "the motorist" = Jeremy Clarkson, and "the cyclist" = Victoria Pendleton, we might make some political progress. Of course "the motorist" on whom "war" is allegedly being waged is not the man or woman who drives a motor vehicle - he or she also walks, and perhaps cycles sometimes, but one thing we can be absolutely sure of is that every motorist is also a pedestrian, while many pedestrians are not motorists. No, "the motorist" in reality means the motor trade, ie the manufacturers of cars and car parts, the oil companies, the car rental companies, the motor insurance companies, and their trade bodies like SMMT, RAC, AA, and not least the privately owned media which depends on them for advertising cash to stay in business, and is truly and deeply in their pockets. Some media of course is able to exercise more independence from this paymaster than others - the Guardian perhaps, v the Daily Mail? Why is any of this important? Because all the central boroughs of London fill every day with commuters. People who live in Wimbledon or Croydon or Basingstoke. Very few of them drive to work, they take the train or tube or bus instead. They may be "motorists" at home, but in the Smoke, they are just pedestrians. They *massively* outnumber motorists. They also don't vote in GLA elections, but then less than half of central London households own a car (and that is not much to do with wealth or poverty, but about practicality)so they are not "motorists" either. When is Boris going to get his head around that fact? Paul touches on a prescient point above, we need to sell this as being about streets for people, or risk a cyclist vs motorist debacle. Keep up the stirling work and keep the pressure up on TfL. For those within the organisation who 'get it' it must be fantastic to know there are people out there who support them, and hopefully will give them plenty of ammunition against the ones that clearly don't. Now, where's my blue marker pen... Someone bring me a map of London! My initial thoughts about the southbound on vauxhall bridge are actually incorrect. What TFL is planning here is down right dangerous. For me, you 100% have to take control of that lane as it is! That is easy when you can go over a bridge at 30mph but how are all cyclists going to take a primary position and feel comfortable holding up traffic? I'm not sure if you are aware, but the blue boxes with the CS logo and number in them are to tell cyclists that you should take a primary position and tells drivers that you should be there. Unfortunately neither party has been informed about this and i still see cyclists putting them selves in a dangerous position by not taking the lane. it is very too nice post and gives us a lot of information about Vauxhall spares, and I think which is well define about superb highways..